Sid in his backyard enjoying a BBQ and his SealTV TV enclosure. Looks like Paul Gallen being interviewed for SOA on TV? I would highly recommend Seal TV, the service is GREAT and the product is OUTSTANDING. I have had a few family & friends gathering watch sports or movies for the kids in our new out door area. Thanks Seal TV for bringing the indoors outside. Sid’s captilisation in that quote, not mine! 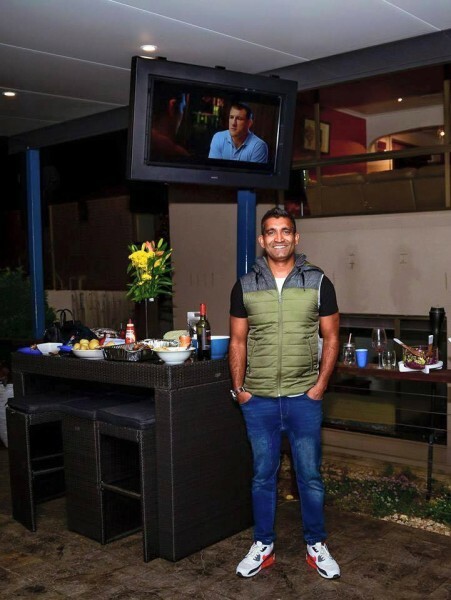 Sid installed a 42″ Al-Fresco Series enclosure in his outdoor entertaining area, which is a full outdoor enclosure and optioned up one of our Anti-Reflective screens to enhance daytime viewing. We will be following up with Sid to get more details on his installation to share with our customers. In the meantime, if you want a similar setup for your own backyard, all you have to do is request a quote! This entry was posted	on Wednesday, October 7th, 2015 at 3:54 pm	and is filed under Blog. You can follow any responses to this entry through the RSS 2.0 feed. Both comments and pings are currently closed.